"Life has to end, but love doesn’t"
On Wednesday, March 13, 2019, at the age of 93, Stewart MacDonald, passed away at St. Martha’s Regional Hospital in Antigonish surrounded by his four loving children (Stewart, Glenn, Darlene and Judy). Stewart was loved by everyone who knew him. We all now have a huge hole in our hearts and will miss him terribly and forever. He was certainly one-in-a-million, and an example to everyone on how to live life to the fullest. His selfless acts and contributions to veterans’ issues will always be remembered. Stewart was born on July 11, 1925 on Crandall Road, Cape Breton to his parents, Alexander Hector MacDonald and Annie Barbara Stewart. After his father passed away in 1930, the family moved to Port Hawkesbury where they settled into a small house on Rose Street. Stewart was the eldest of four children (Margaret, Duncan and Alexander). At the age of 17 (1942), he joined the Royal Canadian Army in order to serve his country in the second world war. He was initially assigned to the Royal Canadian Artillery and underwent his initial training in Brandon and Shilo, Manitoba (1942-1944). After further intensive Infantry and Artillery training in England (1944), he volunteered and was re-assigned to the infantry and posted to the North Shore (New Brunswick) Regiment, "D" Company in Belgium (1944). He was involved in numerous battles / operations in Holland and Germany including Wyler Meer (January 1945), Keppln (February 1945), the Rhineland and the Reichswald Forest (February to March 1945) and finally, Zutphen (April 1945). His Regiment was the first Canadian Regiment to cross the Rhine into the heart of Germany. After returning home to Port Hawkesbury in 1946, he took a few courses through Veterans Affairs and moved to Toronto in 1949 to find work. In 1950 he fell in love and married Leona Rivett. Stewart and Leona raised a family of four children. Leona has been a loving wife and life-long friend to Stewart. In 1951 he joined the Royal Canadian Airforce (RCAF}. After completing his training at St. Jean and Borden (1951-52), he and his family enjoyed numerous postings to Edmonton and Cold Lake, Alberta (1952-58); Baden Soellingen, Germany (twice - 1958-1962 and 1967-1971); Greenwood, Nova Scotia (1962-1967) and Ottawa, Ontario (1971-1977). Stewart served his country with distinction in both Europe and Canada until his retirement in 1977. In 1990 he returned to his most treasured place on planet earth, the sea-bound coast of Cape Breton, Nova Scotia. He resided on five acres overlooking Bras d’Or Lakes until his passing. He always referred to Cape Breton as "God’s country". It was here that he was able to give back to his community and pursue his passion of honouring Canadian Veterans. He was a key founder and organizer of the Veterans Wall" at Legion Branch #43 as well as the Veterans Memorial Park and Monument. He has traveled to Europe on more than six occasions to visit battle sites, cemeteries and memorials in order to personally remember comrades and those that paid the ultimate sacrifice on behalf of Canada. Stewart had a wide range of passions including, his Legion and Military activities (both formal and informal) and his close-knit community and church; travelling the world, collecting unique military and other types of memorabilia, running marathons, enjoying wildlife, playing chess, crib and cards, studying geography and history, debating politics and current events, performing magic tricks, telling jokes, and most importantly making people laugh and smile. Life is about memories. May all those who were touched by our Dad, find great comfort in those precious moments & memories he shared with you. If you have been a victim of one of his practical jokes or pranks then be grateful. It was his way of saying how special you were to him. Stewart was preceded in death most recently by his beloved grandson Jonas Mitchell; his father and mother, Alexander and Annie MacDonald; his sister and brother-in-law, Margaret and Elliott Embree; his sister-in-law Janet MacDonald and his brothers and sisters-in-law Norma & Roy Garlick, Rudy Grzelak, Bill MacDonald, Mervin & Alice Rivett, Stan Matthews and Arnold Rivett. 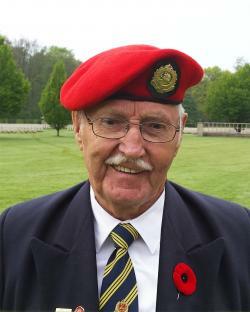 Stewart was also predeceased by many close friends, cherished neighbours, fellow veterans and Legion members. He is survived by his loving wife & life-long friend, Leona; his four very proud children and spouses, Stewart (Donna), Glenn, Darlene and Judith (Glen Campbell); his 9 dear grandchildren and spouses Christopher (Melanie), Candice (Troy Therien), Sondra (Joel Shemrock), Sean (Ellie Doggett), Caitlin (Mark Challinor), Jeremy, Jessica, Tyler (Amanda Thorp), Cody (Zephania Lavoie); his 16 precious great grandchildren MacKenzie, Nolan, Naomi, Lily, Ty, Alex, Atlee, Beia, Wren, Keeler, Brynn, Isabelle, Amelia, Nathaniel, Cameron and Zachary; his beloved brothers Duncan and Alexander MacDonald and sister-in-law Lois MacDonald; his brother and sisters-in-law Ted and Marg Rivett, Vivian Grzelak, Lorraine MacDonald, Helen Matthews and Sherry Rivett; and his many nieces and nephews. Visitation will be held on Friday, April 19, 2019 from 2-4pm & 6-8pm at the Dennis Haverstock Funeral Home, 724 Granville St., Port Hawkesbury. The Funeral / Memorial Service will be held on Saturday, April 20, 2019 at 2pm at the Black River United Church with Reverend Donna Lovelace officiating. Burial / Internment (family only) will take place at MacKay Cemetery immediately following the Funeral / Memorial Service. A Reception in Stewart MacDonald’s Honour (everyone is welcome to attend) will take place at the Community Hall immediately following the Funeral / Memorial Service. MacKay Cemetery, c/o Mrs. J. Landry, 3632 West Bay Road, RR#2, West Bay, Nova Scotia, BOE 3K0. Black River United Church, c/o 60 Manse Road, West Bay, Nova Scotia, B0E 3K0. Veterans Memorial Park Society, P.O. Box 6972, Port Hawkesbury, Nova Scotia, B9A 3S4. The entire medical staff at St. Martha’s Hospital for the wonderful care and support they provided to our Dad and our entire family. They treated us as if we were their family. We are forever grateful. Dad’s cherished friends, Legion members and the people of Inverness and Richmond Counties for enriching his life and making him so very, very happy. Thank you from the bottom of our hearts.